Something worthwhile outweighs its risks. That means no matter the cost, effort or trouble, the outcome is perhaps more valuable than the road it takes to get there. The three exhibitions featured below all take some sort of gamble in their approach, knowing the end game is well worth it. Whether it's abandoning premeditation, trying to capture the story of a certain way of life, or putting contemporary and traditional works of art in conversation with one another, the artists and galleries below roll the dice in terms of process for the good of the final product. We think the fine artwork on display is worth it. Also of note: Our March/April 10th Anniversary issue is fast approaching! Please feel free to contact us if you would like to advertise in the issue. Featured photography by Teresa Coates. We often hear that persistence is key. Sure, but can we also talk about how hard it is? 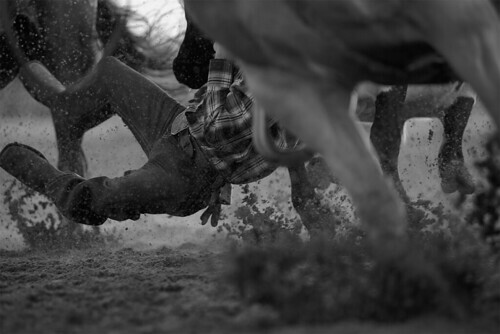 The struggle and significance of persistence will be the focus of the upcoming exhibition at MIT's Rotch Gallery, where photographer Teresa Coates captures the visual narrative of rodeo and its mantra: just hang on. Through her documentary-style photography, Coates explores humanity and the intimate connection between photographer and subjects in the rodeo world. By showing us moments before, during and after the ride, the artist ends up telling a story packed with passion and adrenaline about this sport and way of life. Of her subject matter and inspiration, Coates says, "I am mesmerized by the visceral pleasures of photographing rodeos, by the sound of pounding hooves on earth, the smell of animals, the magic of light shifting from day to night, witnessing human courage in the midst of excitement. Success for me is to capture these feelings in photographs, grasping the necessity of passion in plain view." Teresa Coates is a Boston-based photographer who provides photography services to clients throughout New England. Her services include fine art portraiture, location shots and photography for the web. The black and white silver gelatin prints of Grasping Necessity: A Rodeo Portrait will be on view Monday, February 1 through Friday, April 1 at MIT's Rotch Gallery. The Rotch Library Exhibition space is comprised of a 400 square-foot a gallery plus two additional display cases for exhibits focusing on architecture, art, photography, design, urban planning, housing, community development, geography, globalization and environmental topics. This particular exhibition is funded in part by a grant from the Council for the Arts at MIT. The Art Connection seeks submissions of 2D & 3D artwork for Art BINGO. 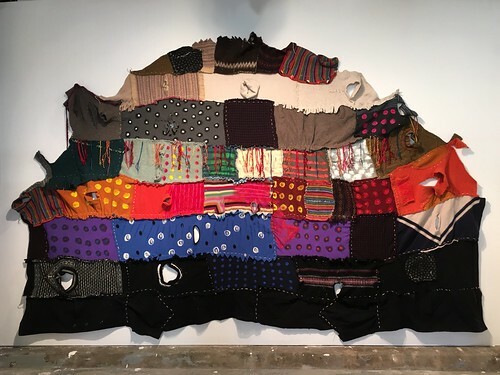 Juried by Katherine French, Director of Catamount Arts Gallery and Former Director of Danforth Art, and Jane Young, Director of Chase Young Gallery. 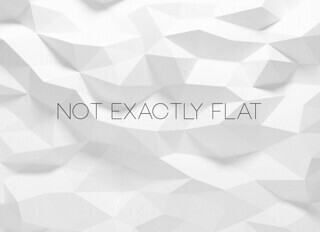 Submit 1- 3 works via https://form.jotform.com/60134914034143 by 2/29/16. 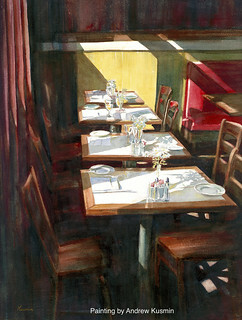 Donated artwork supports our mission to place art in underserved communities. 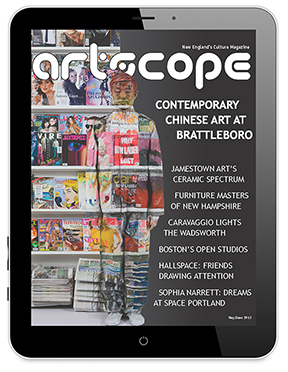 From Feb 3 - 28, Bromfield presents works by gallery artists that explore the notion of 3D art. 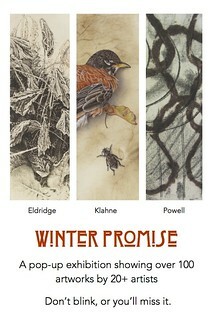 The opening reception is Friday, Feb 5, from 6-830 pm. The closing reception is Sunday, Feb 28, from 3-5 pm. What do you get when you cross a pop-up show with an art gallery? a new art-space in a 150-year-old home near Battle Green. the beauty in impermanence and imperfection. JANUARY 28 - FEBRUARY 14. It's In Our Blood by Caitlin Pritchard. Assorted fabric. 10 ft. by 12 ft.
Perhaps the most exciting part of an open studios exhibition is the occasion for vastly different works of art by an array of resident artists to hang together and provoke dialogues that may never have happened, had they been part of a more traditionally curated display. This appears to be the case at OneWay Gallery's current exhibition, whose roster includes a glassblower who makes instruments out of glass, contemporary and traditional painters, the artist behind Narragansett's first tattoo studio and more. Artist Jeff Bertwell's drawings of rock formations are the perfect wall-mates to A. Dolt's unusual character portraits that have become particular favorites at salon shows. Mixed media artist Caitlin Pritchard, who will show a wall-mounted fabric teepee; Max Van Dexter, an artist working with vinyl; and Jessica Cabral, who infuses her own graphic work with found images, round out the show's contemporary artists. This open studios show allows gallery owner and painter Stephen Cook the chance to mix and match the artists' different backgrounds. "The more traditional artists—Patricia Sylvia and Christine Webb, both accomplished landscape painters—often exhibit at other galleries in the region," says Cook. "But when their paintings are placed beside contemporary work, it gives them a new, different look." OneWay Gallery's open studio exhibition is on view now through Sunday, March 13. The public is invited to a reception at the gallery on Saturday, March 5 from 5 - 8 p.m. During the reception you'll hear sweet music surge from Shaun Conroy's hand-blown, functional glass instruments. You'll view tattoo artist Rachel WS's body of work on models mingling in the crowd. You will see a live demonstration of Christina Lasley's bottle-throwing practice—both art therapy and a means to create shards of glass for material. This is certainly an evening you will not want to miss! Poured enamel by Leah Durner. There is a school of thought that says to plan is to inhibit, and that the uninhibited mind can do great things. It is this way of thinking that informs the current exhibition at Heather Gaudio Fine Art, featuring Leah Durner's series of poured latex enamel paintings alongside Paul Bloch's marble sculptures, highlighting different approaches to improvisation. Spontaneously deliberate is how you could describe Durner's featured paintings—a series of exquisite abstract compositions of framed yet abundant color. Her planned color schemes and palette combinations give way to impromptu spill motion, completely saturating the canvas with unexpected pigments and palette juxtapositions impossible to predict. Durner's work has been critically reviewed by scholars of note in the United States and abroad, and her work is in many private collections. In addition to showcasing her paintings in numerous solo and group exhibitions in various venues, Durner is also a curator and a published writer and lecturer on art theory and history. She lives and works in New York City. Though his work may be equally improvisational as Durner's, Paul Bloch's marble sculptures take longer to execute, sometimes breaching two years to complete. He takes a classical approach when carving Carrara marble, using traditional manual tools to incise, chisel and sand large quarried blocks. With no model to reference, Bloch pushes the material to its limits, resulting in beautifully formed and balanced abstractions. Bloch apprenticed with West Coast sculptor James Pristine in the 1970s and received a grant from the Athena Foundation in 1994 to sculpt at the Mark di Suvero studio in New York City. He has had numerous exhibitions in Italy and Switzerland as well as in California, New York and Santa Fe, where he currently resides. His work is also in many private collections here and abroad. 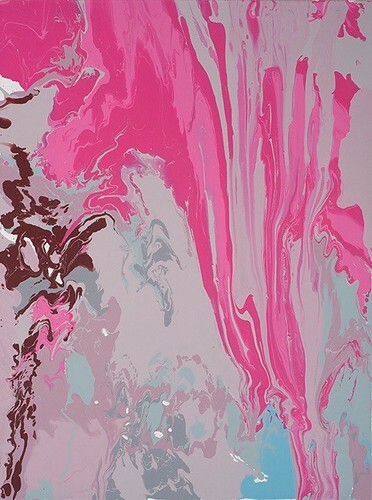 Leah Durner & Paul Bloch is on view now through Saturday, February 20 at Heather Gaudio Fine Art. 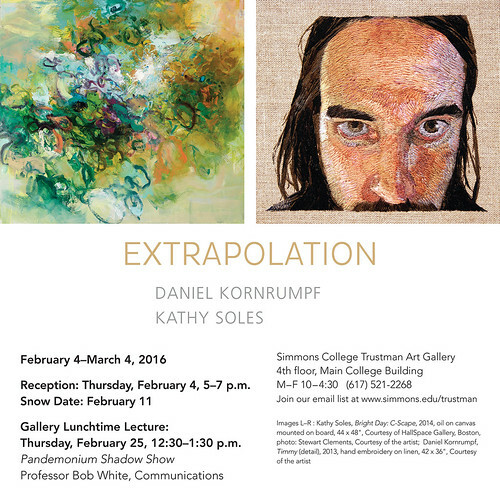 Opening Reception: Friday, February 5, 5 - 8 p.m. 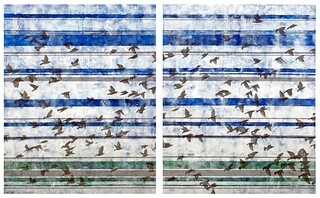 The Language of Lines is a collection of mixed-media pieces by Holly Harrison that focus on the interplay between the organic shapes and fluidity of birds, and the geometry of repeated horizontal line in human structures, showing the way nature and order cohabit the spaces we navigate. Escape the winter cold and experience the fragrance and beauty of WAM's annual four-day floral extravaganza from Jan. 28-31. A feast for your senses, Flora in Winter includes captivating interpretations of artwork created by skilled arrangers and displayed within the Museum's galleries. 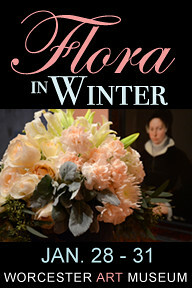 For details and full schedule of events, visit worcesterart.org/flora. Please visit the NEWS website for details.